A common theme here in the Semifinal so far is an early offensive onslaught in the first period. That continued here as the top-seeded ’76-’77 Montreal Canadiens scored four times in the opening frame. Murray Wilson started it very early as he scored his fourth goal of the tournament just 51 seconds into game. Then, five minutes into the period, the Canadiens scored twice within 40 seconds to take a 3-0 lead through Steve Shutt‘s 14th and Pete Mahovlich‘s fourth. Brian Propp was able to stop the early bleeding for the 12th-seeded ’84-’85 Philadelphia Flyers when he scored eight and a half minutes in with his 13th. 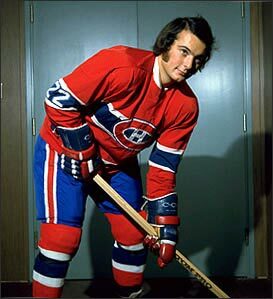 However, defenseman Guy Lapointe reinstated Montreal’s three-goal lead with his ninth of the tourney with about two and a half minutes remaining in the period. In the second period, the Flyers were able to get one goal back with a shorthanded goal from Propp. However, just 21 seconds into the third period, defenseman Brad McCrimmon was called for cross-checking and then just 11 seconds after that, fellow defenseman Glen Cochrane was given a five-minute major for kneeing and a 10-minute game misconduct. This put Montreal on a long 5-on-3 PP. They capitalized 33 seconds into the two-man advantage with Mahovlich’s second goal of the game. The Flyers then chose to pull starting goalie Pelle Lindbergh after he had allowed five goals on 34 shots. That didn’t change much as the Canadiens had some remaining PP time and they were able to capitalize again. This time it was Guy Lafleur scoring his 11th of the tournament to give Montreal a 6-2 lead. At the 8:22 mark of the third, Propp completed his hat trick, but this contest was over. Each team scored once more, including another from Shutt, to make it a 7-4 final, giving the Habs a commanding 3-0 series lead. The top-seeded Habs now have a commanding 3-0 series lead with Montreal having a chance for the sweep coming on Tuesday. Meanwhile, on Monday night, in the other semifinal, the 6th-seeded ’82-’83 Edmonton Oilers will also look for a 3-0 lead over the 15th-seeded ’95-’96 Colorado Avalanche. This entry was posted in Semifinal, Ultimate NHL Playoff and tagged Brad McCrimmon, Brian Propp, Glen Cochrane, Guy Lafleur, Guy Lapointe, Montreal Canadiens, Murray Wilson, Pelle Lindbergh, Pete Mahovlich, Philadelphia Flyers, Semifinal, Steve Shutt, Ultimate NHL Playoff. Bookmark the permalink.